“Mmm, this is delicious. Does it have real strawberries in it, Aai?” J quipped, as he sat tucking into a bowl of yoghurt after dinner one day. “It does taste of them, doesn’t it?” I couldn’t help marvel at the refreshing taste and delightful texture of the otherwise humble offering in front of me. How could a bowl of yoghurt induce such an impassioned conversation between a family of regular yoghurt eaters? Believe me, I know a thing or two about making and eating a good yoghurt. We go through the stuff like nobody’s business, eating it as a staple with rice or just on its own. Yum! My mother still makes it from scratch every day, helped along by the tropical temperatures of western India. I cannot afford that luxury in the cool climes of our temperate country. To be honest, the ease of popping a large tub of yoghurt in my supermarket trolley has its charms. And then you reach a point where either costs increase or quality falters so that you are left making compromises. If there is one thing I will not do is compromise on the quality of food we consume as a family. Eating substandard food kind of defeats the whole purpose of existence. Nor am I willing to pay out of my nose for an everyday convenience. I am left with only one option. Start making yoghurt at home. Nothing wrong with that, I hear you say. Absolutely, as long as I find something easy enough to use and easier still to clean. Without plugs, wires, switches, gears to fiddle with. I have seen expensive gadgets abandoned in forlorn corners of the kitchen far too often. EasiYo’s new bright and bold Red Yogurt Maker is the answer to my yoghurty problems. It is sleek and stylish, yet simple to use. All I had to do was mix an EasiYo Yogurt sachet with tepid water, put it in the EasiYo Yogurt Maker filled to the 1 kg mark with boiling water, and 12 hours later I had 1kg of delicious yoghurt. I promptly popped it in the fridge and ate it within a couple of hours of it cooling down. I love that there are no moving parts or electronics, which makes it easy to use, clean and store. Even more, I love that the yoghurt has live bacterial cultures to maintain gut flora and there are no artificial additives. Like any good yoghurt, it is a great source of calcium and protein. Fantastic for keeping those growing bones and teeth healthy. 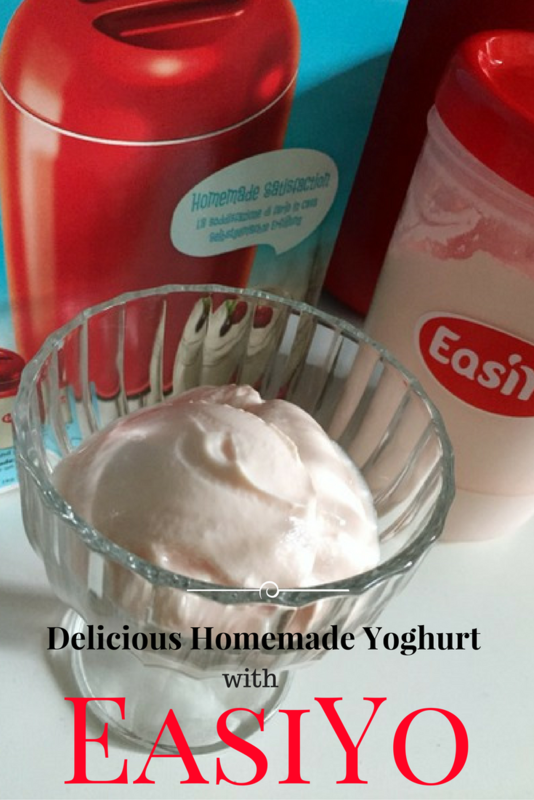 We have tried the new Strawberry and Cream EasiYo flavour and it has been a resounding success with all the family. Next up, Pineapple with Coconut Bites. This time, I might get to try it in a couple of recipes before it gets eaten up as is! You can buy EasiYo directly from their website and from a number of other retailers. Disclosure: We were sent a sample piece and a couple of flavours for the purpose of this review. All opinions are my own. Enjoyed reading that? Then why not subscribe to my blog via email so you don’t miss anything. I promise never to spam you.